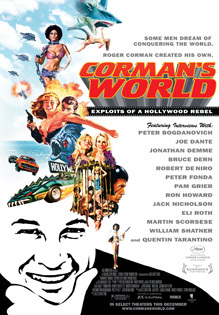 CORMAN'S WORLD: EXPLOITS OF A HOLLYWOOD REBEL is a tantalizing and star-studded tribute to Roger Corman, Hollywood's most prolific writer-director producer, and seminal influencing force in modern moviemaking over the last 60 years. Featuring interviews with Hollywood icons and cinematic luminaries, some who launched their careers within Corman's unforgettable world of filmmaking, including Paul W.S. Anderson, Peter Bogdanovich, Robert De Niro, Peter Fonda, Pam Grier, Ron Howard, Eli Roth, Martin Scorsese, William Shatner and Jack Nicholson, along with many others, this documentary chronicles how Corman created his cult film empire, one low-budget success at a time, capitalizing on undiscovered talent, and pushing the boundaries of independent filmmaking. Director Alex Stapleton weaves archival footage following Roger's illustrious career: From his early days of genre-defining classics including the original Fast and Furious, the original Little Shop of Horrors, The Crybaby Killer, The Intruder, House of Usher, and The Wild Angels (which at that point in 1966 was his 100th film) - to present day video of him and his wife Julie on location, still at work as they continue to produce and distribute films outside the studio system: fast, cheap and out-of-this-world!